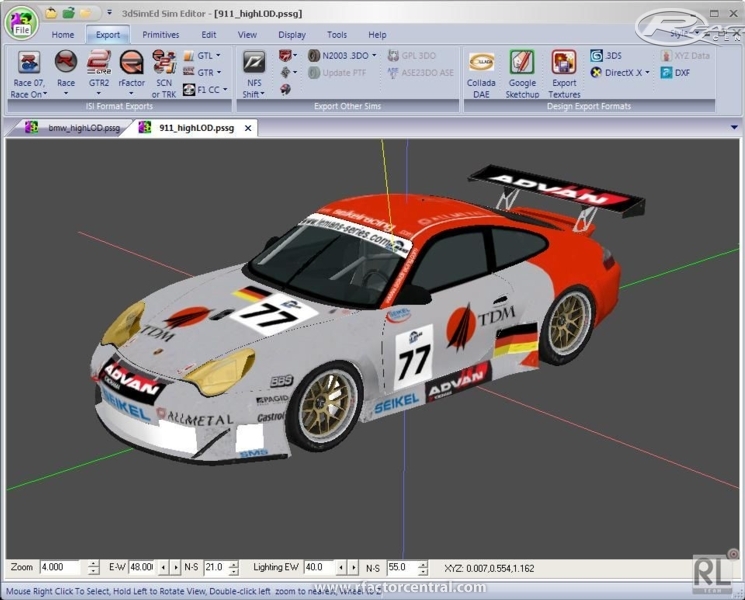 Edit multiple drawings in a single instance of 3DSimED. Context help included. 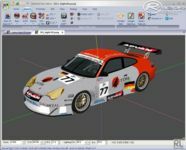 Decompression to a folder of:- .DAT (all Papyrus sims); .MAS (F1CC, F1-2002, NSR, rFactor) ; GTR (GTR, GTR2) ; GTL (GTL).BIG (Toca Race Driver) ; RES, TRK, CAR (Viper Racing and Nascar Heat). XYZ position and rotation including realtime preview. Delete and Replace with new object. Explode to edit faces and vertices of object. Isolate to open a copy of the memory object in a new window. Open of disk object in a new window. Materials loaded from MTS & GMT files. Material editing including assignment of textures, bump mapping, specular mapping, environment mapping, transparency, specular power etc. Copy and Paste of materials. Filter display of model by material. Copy and paste model data and objects. Browse:- .MIP (all Papyrus sims) ; .BMP ; .TGA; .DDS; .TEX; .PNG; JPG. Conversion (single file or batch) to:- .MIP (N2003 & GBL); .BMP; .TGA; DDS ; PNG. Filter model display by texture, material, and or object. Quickly change light source position by mouse. Texture, wire frame and flat shading. Calculation of facet or vertex normals. PLEASE BE SURE TO ENJOY THIS TRACK TO THE LIMIT! just a track for have fun using the handbreak, not beautifull, iknow xD.